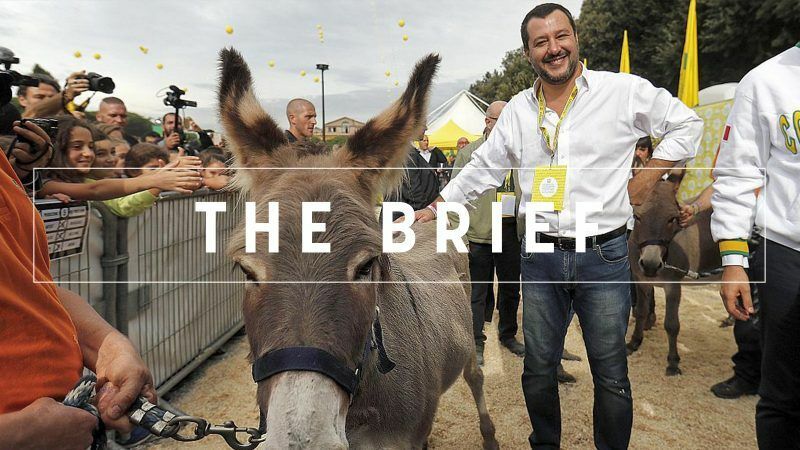 Migration took a backseat for once when Italy’s far-right interior minister, Matteo Salvini, together with his French nationalist comrade Marine Le Pen, launched a joint platform for next May´s European elections. “The enemies of Europe are those sealed in the bunker of Brussels. It’s Juncker and Moscovici who have brought fear and job insecurity to Europe,” Salvini said on Monday. “The politics of austerity of the last few years have increased Italian debt and impoverished Italy,” he added. Italy’s response is to reach a deficit of 2.4% of GDP next year, three times higher than the previous government’s target, and disregard any efforts to cut down its gigantic debt. This ‘serious non-compliance’ with the Stability and Growth Pact, already flagged last week in a Commission letter sent to Rome, would lead to the unprecedented rejection of the Italian budget for 2019, as we reported this morning. Once the EU executive receives the draft budget by mid-October, the institution will issue a negative opinion within two weeks. Rome would then have three weeks to rewrite its budgetary plan. But Salvini and his populist brother- in-arms, Five Star leader Luigi Di Maio, said Italy would not retreat. Austerity’s impact is still visible in Europe, so Rome is betting against the Commission’s determination to rigorously apply the fiscal rules months before the European elections. But Italy is arguably one of the countries that benefited the most from the post-crisis approach to relaunching the European economy. According to the Commission, Rome avoided adjustments worth 1.8% of its GDP (around €30 billion) thanks to the loose application of the Stability Pact. The EU’s investment plan allocated €8.5 billion across the Italian economy, triggering almost €50 billion in additional spending. And out of the 12 million jobs created in Europe since 2014, one million were in Italy. Salvini may disagree with Juncker or Moscovici’s economic recipe since they took over in 2014. But they are hardly the ones to blame for Italy’s €2.3 trillion in public debt (the world’s third largest), and its weak economic performance during the past decade (an average of -0.6% GDP decline between 2006 and 2016). The reckless stance of the eurozone’s third largest economy toward its debt would not only affect its partners in the monetary union, as the eurozone finance ministers told Rome. It would also damage Italians. The short-term benefits of additional spending would disappear against the long-term impact of massive debt obligations. Salvini and Di Maio are not betting against the EU institutions and the markets by using voter dissatisfaction but the size of their economy. Italy is ‘too big to fail’ and they may believe that their compatriot, ECB boss Mario Draghi, would eventually restore peace like he did in 2012 when Italy and Spain were against the wall. But they should bear in mind the fate of their populist predecessor, Silvio Berlusconi, when he was forced to leave in November 2011 and Rome had to adopt an austerity programme. Rome’s headlong rush to escape from its commitments with its EU partners could still cause a lot of harm not only to Italians but to the whole of Europe. The risk premium of its 10-year debt, the highest in almost five years, would continue to soar as the budgetary dispute continues to worsen. Although other economies, in particular Spain, are not suffering the current market turbulences, the risk of contagion could materialise like last spring when the Italian coalition took power. As a result, European economies would have to offer bigger returns to investors to finance their economies. And one euro more to pay debt obligations is one euro less to pay teachers. This wouldn’t be the result of the austerity policies dictated by Brussels, Berlin and Frankfurt in the past, but the consequence of Salvini and Di Maio’s dangerous attempt to satisfy the unrealistic promises they made to voters. And those who go against the interest of their fellow Europeans can hardly call others ‘the enemies of Europe’. Besides the dance moves at the European Week of Regions, Commission chief Jean-Claude Juncker hit out at ‘stupid populists’ and called on Europe to “stand up” to the far-right. Europe’s ‘decentralised cooperation’ has made it possible to better adapt the EU’s cooperation and development policies to the needs of the people in the field. It will remain at heart of EU’s external action, says Commissioner in charge of international cooperation and development, Neven Mimica. Juncker right-hand man Frans Timmermans is expected to announce his candidacy to succeed his current boss. Look out for an official statement. Experience garnered during previous enlargements has taught the EU a lesson: the bloc should not import existing disputes when granting membership, an EU spokesperson told EURACTIV. Dutch climate change ambition is insufficient, a court confirmed and instructed the government to cut greenhouse gas emissions at a faster rate than planned. The eurozone is expected to grow by 2% this year due to Brexit and low productivity, two-tenths less than what was expected in July, warns the IMF. Ireland joined Finland, Sweden and the Czech Republic in taking a stance against plans for an EU digital tax, which could bring in as much as €5 billion in tax revenue annually. The vision for decarbonising the European building stock is clear enough: now comes the time for the member states to enforce these commitments. Read our Special Report here. The European Parliament’s environment committee meets to talk COP24, IPCC report and, maybe, increasing the EU’s emissions pledge for 2030. Stay tuned. Oh and pop along to the Frankfurt book fair if you can, Commissioners Mogherini and Gabriel will be there.